Young cello players in Fairbanks took to their fat-tire bikes Saturday to create a 900-foot-long image of a cello embellished with a jack-o'-lantern face in the snow. The "cell-o-lantern" was intended to be a greeting from students in the Alaska Cello Intensive to concert cellist Zuill Bailey, who is in town this week to perform the Dvorak Cello Concerto with the Fairbanks Symphony Orchestra. "They were hoping he'd see it when he flies in," said Alaska Cello Intensive director Rebecca Levey. "For these kids he's like an idol, you know." 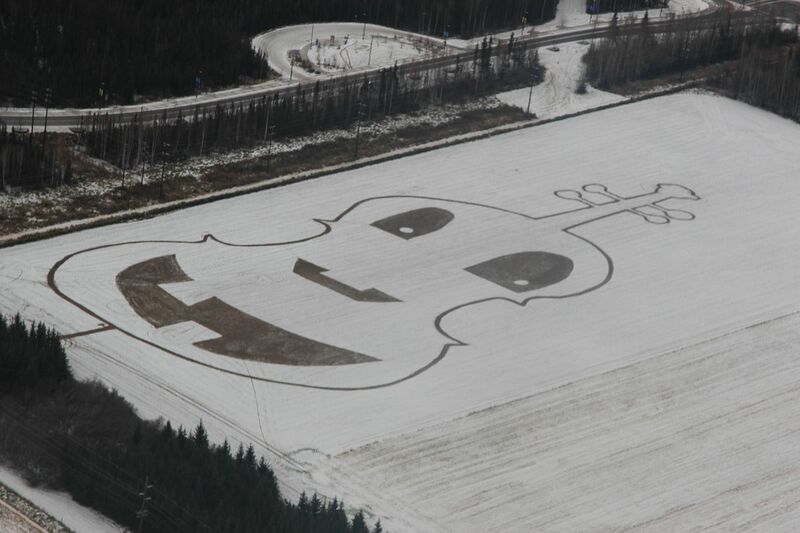 The giant sketch was drawn on a fallow field owned by the Agricultural and Forestry Experiment Station at University of Alaska Fairbanks. About three-quarters of a mile in circumference, the design was laid out on foot using a GPS device. Once the route was flagged, the cello students followed the course, pulling tires behind their fat-tire bikes to remove a light coat of snow over a field on the north side of the city. Levey said that drawing the cell-o-lantern took about three hours. "It went pretty fast," she said. "Fat-tire bikes get really good traction in this snow." A video was made of the project, using footage from a camera-carrying drone and an airplane, piloted by a Fairbanks resident who happened to be flying out the next day to check on a trap line. The short video was edited by staff and students at the intensive. The Cello Intensive is a Fairbanks-based educational organization that runs year-round workshops and hosts a two-week intensive each summer that Levey described as "a rigorous program of music and outdoor activity." A cello choir of about 15 students is now winding up a weeklong festival with concerts at the University of Alaska Museum of the North and Raven Landing Community Center. The cell-o-lantern picture can be easily seen from the museum, which is located on a hill. Upward of 30 students age 6-18 participate in the summer programs, which are attended by students from around Alaska. Levey said the number was closer to 15 in the winter. The workshops and summer intensive use teachers from around the country, but Bailey has not previously been among them, Levey said.